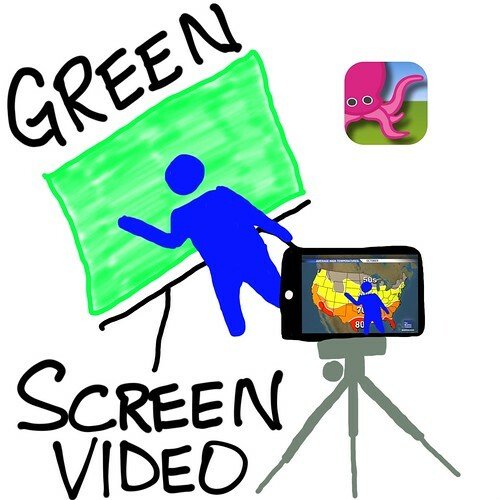 Before learning tips for iPad videography and the steps for using these apps, however, I showed participants the following four green screen videos. 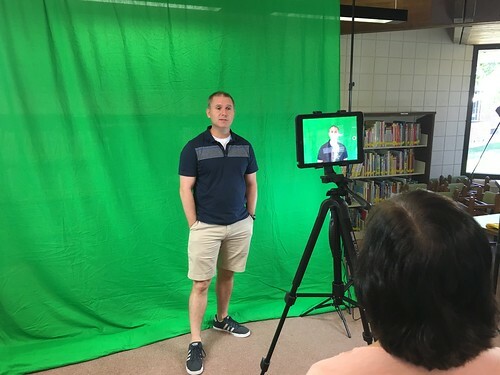 These not only provide a nice overview of some video possibilities using green screen effects, but also (hopefully) encouraged teachers to use their iPad Media Camp videography skills for personal videos and special events. One of the basic contentions of “Playing with Media: simple ideas for powerful sharing” (2011) is that teachers need opportunities to create and share different kinds of media products in “digital sandboxes” where the stakes and stress levels are low. Creating green screen videos and other “quick edit videos” for family members on their birthday, for Mother’s Day, Father’s Day, Christmas, etc. can provide a great context to develop digital literacy skills with iPad videography. The first green screen video example I shared was the May 2016 Mother’s Day video our family made for my mom in Kansas. Each member of our family recorded a short message about a favorite memory with my mom, and I edited a final video together which had related images behind each person’s video memory. The second green screen video example was the June 2016 Father’s Day video our family recorded for my dad. This one was a little more creative. My wife suggested we create an acrostic poem using the name our kids call him (“Wildcat”) and then we photograph ourselves spelling out those letters with our bodies. Then different people shared a memory about why he personifies each word / character trait. I edited the videos together with iMovie. This turned out really well. Third, I showed teachers the short version of Shelly’s students’ “I Have a Dream” speeches which they wrote and recorded last spring in her 3rd and 4th grade classroom at Positive Tomorrows School. This is one of the most powerful and touching videos her students have ever created, and definitely my favorite green screen video example to show from any classroom. I dare you to watch it and remain unmoved. Fourth and finally, I shared the 8th grade Spanish class skit, “Buscando A Dory.” (Searching for Dory) This video is included in a YouTube video playlist of student Spanish skit projects which students in Eric Chaverri’s Spanish I classes at Casady School created last Spring. They are shared on the new “Casady Student Projects” YouTube channel which we started last year. The students who created this group video used some advanced techniques I shared with their class in January, importing video backgrounds into their green screen movies on their iPads. The students did a fantastic job with it! Each of these green screen video examples helped introduce teachers at iPad Media Camp to the potential and possibilities of green screen videos! If you are helping teachers learn about green screen videography, especially using iPads, please share some or all of these examples with them! If you share any of them, please let me know by sharing a comment below or sending a reply to me on Twitter. The full 3 day agenda and linked resources from last week’s iPad Media Camp are openly available on the iPad Media Camp curriculum wiki, which is a Google Site. Three cheers for the Green Screen app by Do Ink and iPad videography! The videos are very nice. So informative. get ready….WeVideo iPad app will have green screen by Fall!